The equilibrium of a stream corridor can be disrupted by various factors. In North Carolina, direct channel modification (channelization) and development of the watershed are the most common causes of watershed-scale instability. If watershed-scale instability is occurring, the designer must address these changes before bank stabilization or habitat improvement structures are installed. During watershed-scale adjustments, channel evolution usually progresses upstream. For example, an incised stream might have a downstream reach that is developing a new floodplain at a lower elevation. The rate of bank erosion is decreasing as the channel dimension, pattern, and profile become stable for the given slope and drainage area. The disturbance can have effects that move upstream, however, causing degradation, widening, and then deposition. Reach or local instability refers to erosion and deposition at a specific place in the watershed and will not have major consequences upstream or downstream of the impaired reach. Perhaps the most common form of local instability is bank erosion along the outside bank in a meander bend. Local instability can also occur in isolated locations as the result of channel constriction, flow obstructions (ice, debris, structures, etc. ), or geotechnical instability (high banks, loss of vegetation, soil structure, etc.). Local instability problems are amenable to local bank protection measures. Caution must be exercised if only local treatments on one site are implemented. The stabilization treatment must begin and end at stable riffles. 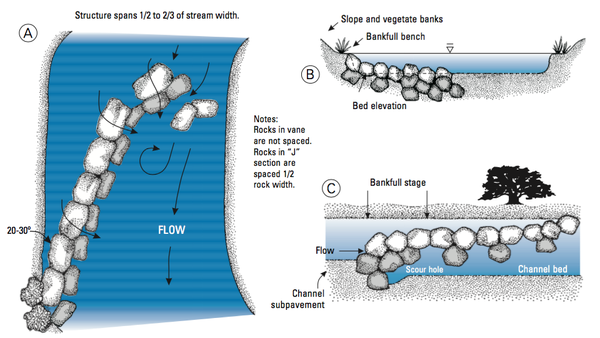 Streambanks can be eroded by moving water or by collapse. Collapse, or mass failure, occurs when bank materials cannot resist gravitational forces. Banks that are collapsing or about to collapse are referred to as being geotechnically unstable. The physical properties of the streambank should be evaluated to determine potential stability problems and to identify the dominant mechanisms of bank instability. Streambank factors that should be considered include bank height, bank angle, surface protection, soil material, and soil stratigraphy. Whenever possible, the streambank stabilization measure should reconstruct the bank so that bankfull is the top of the bank. This often means building a bankfull bench as shown in Figure 1. Whether streambank erosion is a localized problem or part of a larger restoration project, root wads and rock vanes, can be used to stabilize the streambanks and improve aquatic habitat. Figure 1. Many streams in the North Carolina mountains and piedmont are incised. The potential for erosion increases as streambank height increases. These incised and eroding streambanks should be graded to include a bankfull bench. Root wads include the root mass or root ball of a tree plus a portion of the trunk. 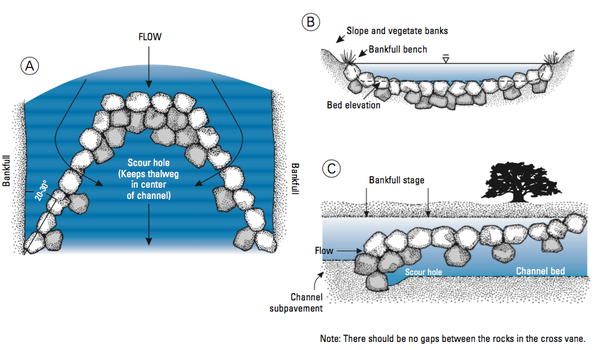 Root wads are used to armor a streambank by deflecting stream flows away from the bank. They also provide structural support to the streambank, habitat for fish and other aquatic animals, as well as a food source for aquatic insects. An example of a root wad is shown in Figure 2. Root wads should have a basal diameter between 10 and 20 inches. Use larger diameter root wads for the trenching method, discussed below. Install root wads where the primary flow vectors intercept the bank at acute or right angles. It is generally not necessary to place root wads against each other for the entire length of a meander bend. It is very important that the root wads are installed at the toe of the bank. 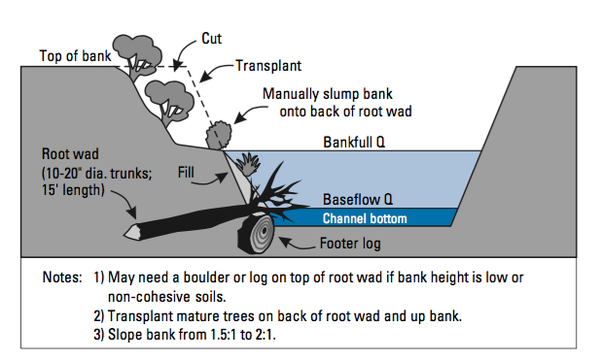 Generally, one-third of the root wad should be below the baseflow elevation. 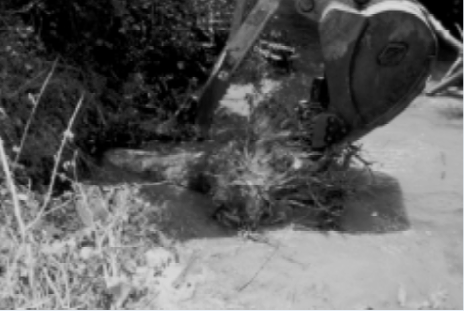 In locations where scour depths are high, footer logs should be installed below the root wads. In locations where bank heights are low, 1 to 1.5 times bankfull height, 1 ton or larger boulders should be placed on top of and behind the root wad. If bank heights are high; however, with plenty of vegetation and root mass, footer logs and boulders may not be needed. There are two primary ways to install a root wad: 1) the drive-point method, and 2) the trenching method. If it can be used, the drive-point method is preferred because it disturbs the least amount of soil and is more cost effective to install. The drive-point method inserts the root wad directly into the bank, as shown in Figure 3. It is helpful to sharpen the end of the log with a chainsaw before “driving” it into the bank. 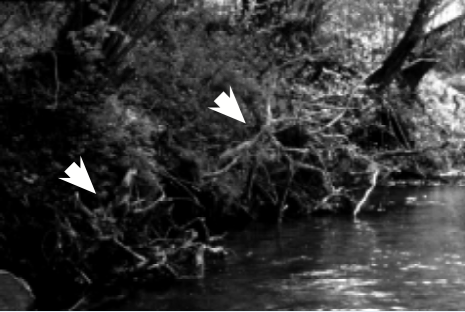 Orient root wads upstream so that the stream flow meets the root wad at a 90-degree angle, deflecting the water away from the bank as shown in Figure 4. A transplant or boulder should be placed on the downstream side of the root wad if a back eddy is formed by the root wad. If the root wad cannot be driven into the bank or the bank needs to be reconstructed, the trenching method should be used. This method requires that a trench be excavated for the log portion of the root wad. In this case, a footer log can be installed underneath the root wad. The footer log should be placed in a trench excavated parallel to the bank and well below the streambed. The root wad is placed on top of the footer as shown in Figure 5. One-third of the root wad should remain below normal base flow conditions. Once the root wad is installed, the trench is backfilled, and the bank rebuilt with transplants or sod mats. The upper bank or terrace scarp should be graded to at most a 1.5-to-1 slope, seeded with an annual grain or native seeds, and covered with an erosion control fabric. Figure 2. Root wads after installation. Figure 3. Root wad installation using drive-point method. Figure 4. Root wads should be installed on the outside of the meander bend. They should be angled upstream to deflect the stream flow away from the bank. Figure 5. Cross-section view of root wad design. The three most common types of vanes are: 1) single vane, 2) J-hook vane, and 3) cross vane. Vanes are most often constructed from boulders. 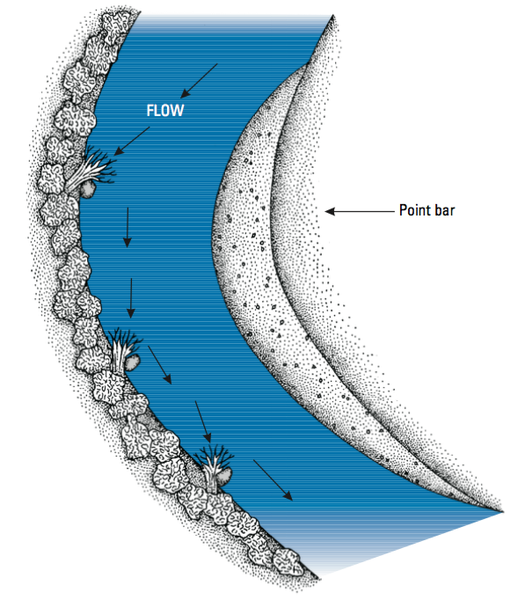 Vanes 1) protect the streambank by redirecting the thalweg away from the streambank and towards the center of the channel, and 2) improve in-stream habitat through scour, oxygenation, and cover. All three vanes are oriented upstream with angles off the bank from 20 to 30 degrees. Vanes are located just downstream of the point where the stream flow encounters the streambank at acute angles. The structure is highest next to the bank, generally starting at bankfull. The structures slope down, pointing upstream. The size of rock will depend on the size of the stream, but generally will be heavier than 1 to 2 tons. Flat rocks are preferred. A common rock dimension for a vane is 6 feet by 4 feet by 3 feet for larger streams (bankfull width greater than 20 feet). As a rule of thumb, use the largest rock possible. The length of a single vane structure can span one-half to two-thirds of the baseflow channel width. The slopes of the structure can range widely, from 2 to 20 percent; however, longer, flatter structures are preferred for maximum length of streambank protection and maximum habitat creation. The rocks in all three structures must touch each other (except last two rocks of J-hook) and have footer rocks to the depth of scour. Generally, one to two rocks underneath and downstream of the top rock will suffice. It is very important to include the footer rock downstream of the top rock to prevent the structure from sinking into a scour hole. Figure 6 shows the design drawing for a single rock vane. J-hook vanes are built just like rock vanes except for the last two or three rocks. These rocks are spaced about one-half of the rock diameter to create flow convergence. The result is a large scour hole for energy dissipation and aquatic habitat. Figure 7 shows the design of a J-hook vane. Cross vanes are used to provide grade control, to keep the thalweg in the center of the channel, and to protect the bank. A cross vane consists of two rock vanes and one center structure perpendicular to the flow. This center structure sets the invert grade of the streambed. Therefore, this structure can be used to raise the bed and is often used at the head of a riffle to set the elevation of the upstream pool. Figure 8 provides the design specifications for cross vanes. Examples of vanes are shown at the Stream Restoration Institute website. Figure 6. (a) Plan view, (b) cross-section, and (c) profile views of a rock vane. Figure 7. (a) Plan view, (b) cross-section, and (c) profile views of J-hook vane. Figure 8. (a) Plan view, (b) cross-section, and (c) profile views of cross vane. 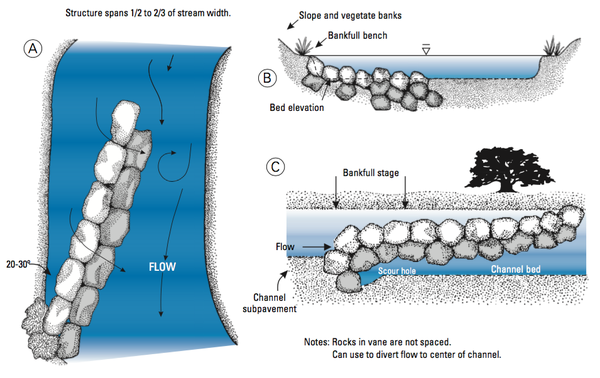 Before using the design specifications and suggestions in this fact sheet to install root wads and rock vanes, the designer must first complete a thorough morphological assessment of the stream reach and watershed. Selecting methods for stabilizing a streambank is one of the last steps in a natural channel design. 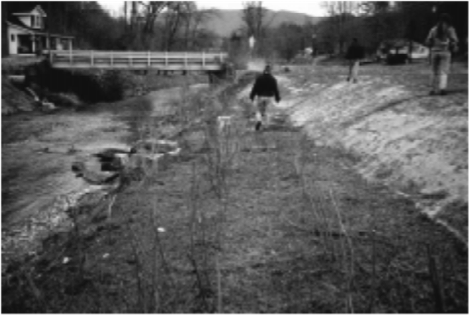 The methods in this factsheet are not “the only methods” for stabilizing streambanks. Designers are encouraged to use a variety of techniques depending on site conditions and supply of native materials. Check the Stream Restoration Institute website for other stream restoration-related materials. Federal Interagency Stream Restoration Working Group. 1999. Stream Corridor Restoration: Principles, Processes, and Practices. Federal Interagency Stream Restoration Working Group. Washington, D.C.
Rosgen, D.L. 1998. River Restoration and Natural Channel Design Course Handbook. Wildland Hydrology. Pagosa Springs, CO.